The PrintFIX PRO was reviewed a while ago (original PF PRO review), and produced good quality icc printer profiles. This has been updated. 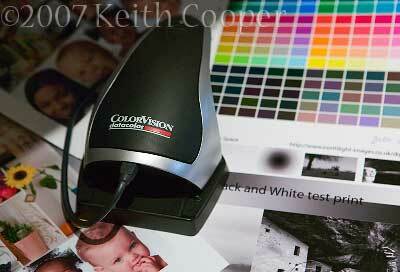 ColorVision (Now Datacolor) have now brought out Version 2 of the software package. It’s a free upgrade which includes a substantial number of improvements and a range of new features that will be of definite help to those wanting to make their own printer profiles. Of particular interest to us is the much improved support for black and white printing. This review looks at the Apple Mac version of the software, however the Windows version is essentially the same. Keith has been trying out the PrintFIX PRO with a new printer we were recently testing. The PrintFIX PRO software version 2 follows much of the working procedures of the original software, so I’ll not go over details of operation, rather show some of the additional features, and how some existing functionality has been improved. At the most basic level, the profile generation algorithms have been tweaked and improved so as to get better and more consistent profiles. You can use your existing measurement sets and make use of the more advanced options. You can of course just go ahead and produce a profile without touching these settings. You can reference the greys printed via your profile to the paper white, or go for ‘absolute greys’ which are strictly neutral. Note the panel to the right of the adjustment sliders. You can also import Photoshop curve files to further alter profile generation. Start by opening your sample image in Photoshop, and softproofing it through your printer profile, using the Custom Proof Setup command. Now edit this image using a Photoshop .acv curve, at Image > Adjust > Curves. Global curves adjustments will effect brightness in the selected tones. Red, Green, or Blue curve adjustments will change color balance in the selected tones. Now name your curve set and save the .acv file to PrintFIX PRO’s Data > Presets folder. 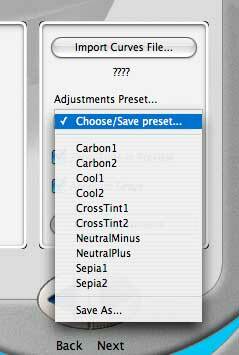 Select this curve set in PrintFIX PRO’s Build Profile Setup window to apply it to your profile. Do remember that editing profiles and general tweaking can only fix so much. It is still vitally important to go through the media settings setup and get things right at the start of the process – skimp on this stage and you will waste a lot of ink, paper and time. One excellent feature of the old software was the extensive help system – you could learn an awful lot about colour management and profiling by studying it. I’m glad to say that it has been extended and even includes a whole section on the mysteries of soft proofing. You can use the ‘Soft Proof’ option to check various aspects of your profile performance after building one. But do take time to read up on exactly what is going on and the limitations of using it – it really helps, but don’t just assume it will ‘fix’ any problems you might have. As before, you have to accept that some paper/ink/printer combinations are just not much good, and no amount of profiling will help. 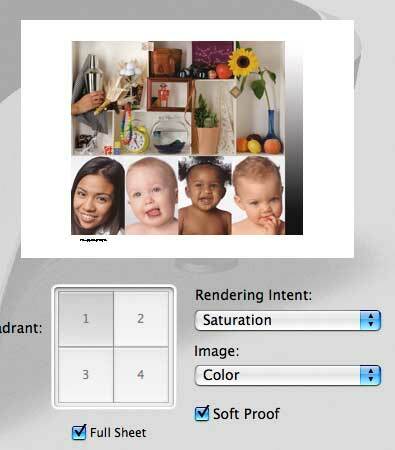 Checking a profile using ‘Soft Proofing’ – there is also a useful guide in the help files explaining how to choose which rendering intent to use. One area that I was particularly interested, in was the option to print a new set of patches specifically for improving greyscale performance. Note that the patches are mostly just off neutral grey. Hopefully the combination that produces a ‘true’ grey is in there somewhere and can be used to give a neutral greyscale with your printer. If you are really keen on making lots of measurements, here’s the full set that I tried when making a profile for PermaJet Fibre Base Gloss paper for an Epson R2400 with a PermaJet Eco-Flo ink system. 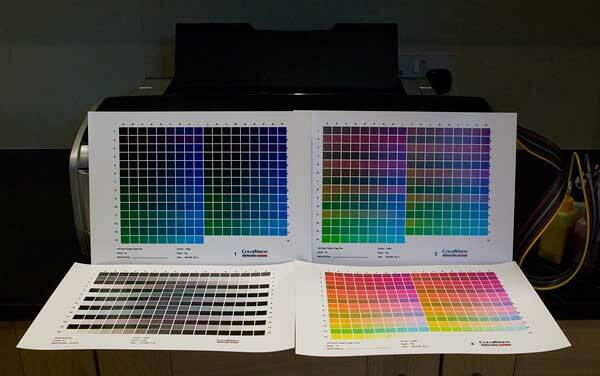 ColorVision have listened to what people wanted to do with the PrintFIX and have said they intend to introduce more features and options over time. The current software (V2) has a range of tools available of interest to people wanting to get a bit more into colour management. While you could always make spot (Lab) measurements with the spectrocolorimeter, you can now export files of Lab values and Density measurements. 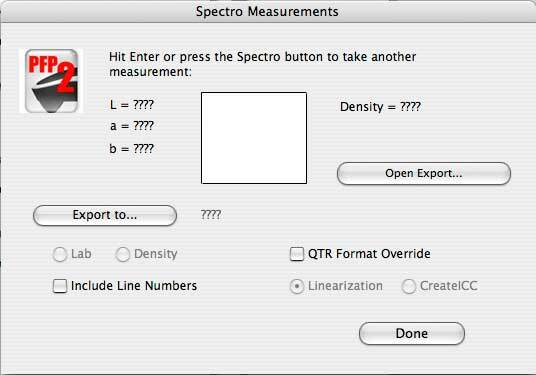 You can set a file to export the readings to, make readings with the spectrocolorimeter, and when finished click on ‘Done’ to export the data in a number of formats. You can even export your normal patch measurement files in text format. Note the mention of QTR on the panel – QuadToneRIP. 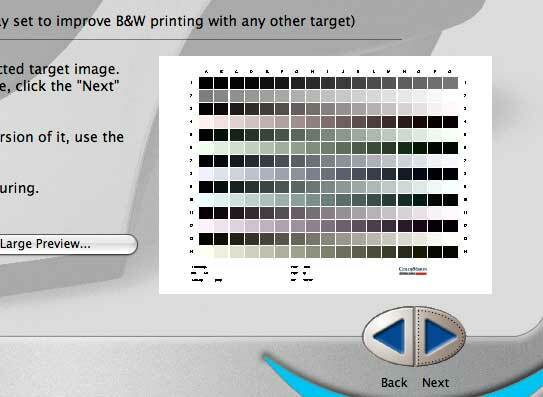 QTR is aimed at specialist black and white printing, but you can also use it to generate luminance only icc profiles to linearise black and white printing. 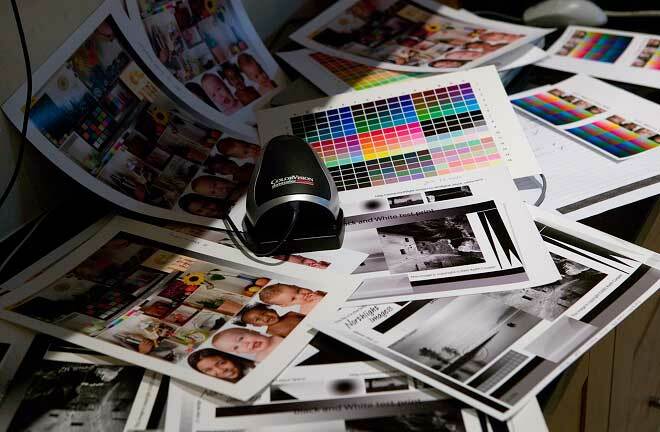 There is a section in the help files that describes different options for black and white printing and profiling. I tried out the new PFP when I was lent an Epson R2400 by PermaJet, to have a look at their Eco-Flo ink system and some papers. The colour profiles generated for Fibre Base Gloss (FBG) paper were excellent – better even that the default one that was provided by PermaJet (they have told me they are updating their profiles ;-). For black and white results, just look at the picture below. The somewhat magenta print next to the spectrocolorimeter was produced using the default colour profile. The one below it was using a PFP2 profile (built with extra greys). I tried using the Epson Advanced B/W mode printing and it was almost as neutral (in tungsten halogen lighting) as the PFP profile. When I created a QTR luminance only profile to use with the ABW mode, it was slightly more linear than the PFP profile, but still not as neutral. We make a specific point of not selling hardware, but if you found the review of help please consider buying the Spyder Print, or any other items at all, via our link with Amazon. In fact if you look carefully at the photo at the start of the article, you can see the non-linearity and magenta tinge of the default (PermaJet) profile. The difference was obvious and now the one that had previously looked ‘great’ was all a ‘funny colour’. If you already have the PFP then the upgrade is a no-brainer (it’s free!). 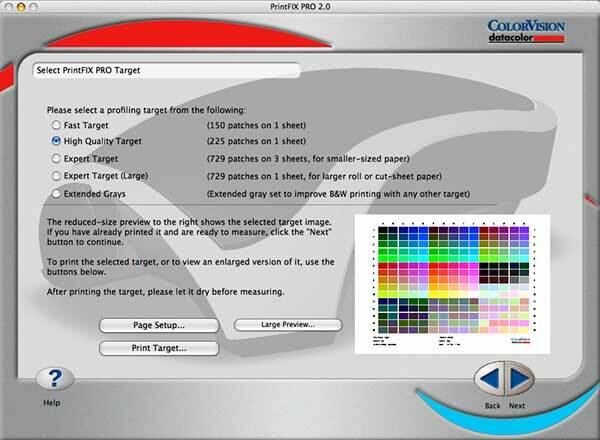 If you want a good tool to make yourself high quality colour profiles, the PrintFIX PRO should meet many of your needs. If you are into black and white, then it’s an excellent tool that could dramatically improve the quality of your prints. Support for ‘non-standard’ ink sets and printing via other than the normal printer drivers has been improved. Just remember that to get the very best results, you -will- need to make the effort to really understand what you are doing … and -why- you are doing various things. For information about printers, paper reviews and profiling (colour management) see the Printing section of the main printers and printing page, or use the search box at the top of any page. All colour management articles and reviews are indexed on the main Colour Management page - please do let Keith know if you've any questions, either via the comments or just email us? Why don't my prints match my screen? A short article showing why there is more to getting your prints to match your screen, than just calibrating your monitor. It's the vital first step, but you do need to consider some other factors for best results. Why are my prints too dark - some basic suggestions to this common problem.